When NPR started a news report recently with the quote “With a growing public concern about online privacy…” it made me laugh. Years ago, when the Web was new, and URLs were long, a company called Digital Convergence (DC) came up with a nifty device that made it easier for people to link advertising to web sites. 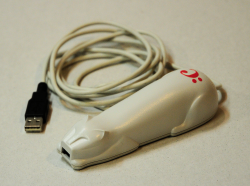 It was called a :CueCat and was distributed by the hundreds of thousands. They were available free from magazines like Forbes and Wired, and retailers like RadioShack. That’s my :CueCat in the photo. You were supposed to use it to scan in barcodes from magazine articles (and other physical items that had a code applied). The scanner would then take you to a website related to the advert or item. Sounds a bit like a QR code, doesn’t it? For it to work properly, you had to register your :CueCat and provide identifying data; ZIP code, gender, and email address. Each device has a serial number and when people realised that it would be possible for Digital Convergence to connect the serial number to their information and track whatever they had scanned and then use that information for some undefined purpose, people freaked. It was regarded as a terrible invasion of privacy and a breach of faith with the user. There was an outcry, and I remember articles both online and in tech magazines lambasting the company for their presumption. People set up webpages explaining how to prevent the :CueCat from sending information back to Digital Convergence (it was known as ‘declawing’ the cat). Digital Convergence threatened to sue people who made those explanations public. DC then made a bunch of changes to its ELUA saying that the people who had the :CueCats weren’t the owners and weren’t allowed to discuss the product – especially if that discussion involved declawing. When those changes were noticed, the firestorm of criticism got even louder. Eventually the product died and Digital Convergence filed for bankruptcy. Enough of the history lesson, fast forward to today. We may say we (still) care about privacy, but our actions speak louder than words. We use mobile phones that broadcast our location back to the phone company (yeah, I know, if it didn’t do that the phone wouldn’t work). We say yes, and click past the “this program requires the following permissions” for every app we install. We leave “cookies on” in our browsers, to help make websites work better for us – but at the same time we leave a trail of trackable cookie crumbs around the web. We use Facebook, who’s arcane privacy settings are constantly changing – and rarely in our favour. And then we use our Facebook ID to log into to other sites, permitting Facebook to gather that information as well. We’re obviously comfortable sharing our data, or blissfully ignorant. Maybe wilfully ignorant. Most likely all three. The level of tracking and the ability companies have for data mining leaves Digital Convergence and the old :CueCat in the dust. What we don’t have is an outcry like we had in 2000. Some rumblings, but it’s more against government surveillance than actual privacy concerns, and I find that really interesting – and relevant for those of us who create content, especially if it lives on the web. I’ll have more about how I think it affects us in an upcoming post.